This is a day when The Legal Genealogist should be totally distracted. When deadlines, new lectures, syllabus materials and even (gasp) the pay-the-bills job should all be set aside for a few hours. When instead of census records and probate courts and tax forms, it should be hot dogs, crackerjacks and the crack of a bat. It should be — oh yes it should be — Opening Day in New York. Today was the scheduled first home game of the season for my favorite team — the team so much of the rest of the country loves to hate — the New York Yankees. At 1:05 p.m. Eastern Daylight Time, the first pitch should have been thrown out against the Houston Astros. Mother Nature, however, had other ideas. It’s barely 40 degrees right now, and a light rain is falling. So — alas! — that first pitch of the season has been postponed. Opening Day 2016, the 114th season for the Yanks, will now be tomorrow. But it isn’t possible to mope around and think that there’s no joy in Mudville — not when the National Archives gets into the act. I’ve written about this book before2 but it’s worth mentioning again and again — not just for people who love baseball, but also for people who love the law. • If you’re at all interested in patent law, you know that the law — now codified at 35 U.S.C. §§ 1 et seq. — was incorporated into American law and given constitutional status in the United States in 1789 as part of Article I.3 And how does Baseball: The National Pastime in the National Archives begin? With images of patents for baseball bats and balls and gloves. • Ever have occasion to look into the laws that sent Native American children to boarding schools4 or that sent Japanese American citizens into internment camps during World War II?5 In Baseball: The National Pastime in the National Archives, you’ll find photos of the baseball teams from many of the Indian Schools and the internment camps. 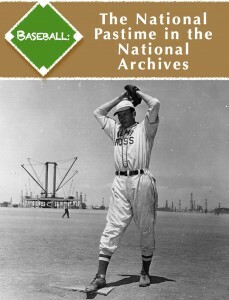 • Interested in World War I draft registrations — and the law that required that registration?6 In the pages of Baseball: The National Pastime in the National Archives, you’ll find the draft registration cards of George Herman Ruth — better known as Babe. And Ty Cobb. And Shoeless Joe Jackson. And Charles Stengel — better known as Casey. So even if there’s no first pitch today, there is joy in Mudville — legal style — with Baseball: The National Pastime in the National Archives. You’re not the only Yankees fan, though they’ve always been my second favorite team! My beloved, although often disappointing, Cleveland Indians also had to cancel today. The weather today was far more suited to our also often disappointing Cleveland Browns. Wow! This is a great blog post, especially coming from “The Legal Genealogist.” Thank you! I wish I would have seen it and the earlier one when I was still working at NARA. I’ll make sure and forward it along to my former colleagues and co-authors. As Rangers, Nationals, and Cubs fans, we had such joy researching and crafting the book. It’s a wonderful piece of work, and thank you all for writing it!